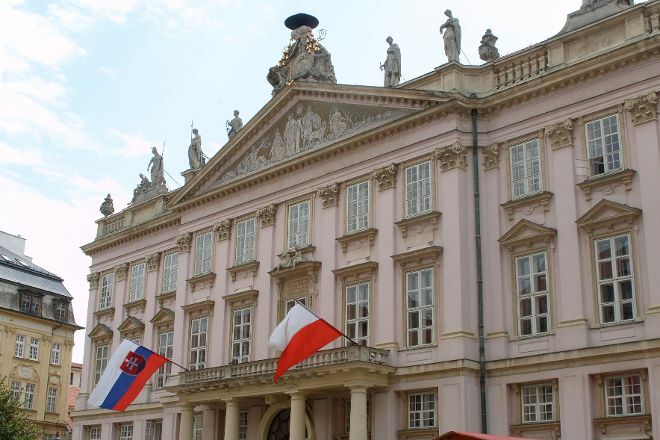 Once the residence of an archbishop and the site of the treaty that would dissolve the Holy Roman Empire, Primates' Palace (Primacialny palac) today serves as the office of the mayor. Visit the palace, finished in 1781 and now open to the public, and admire its ornate facade featuring a wealth of neoclassical architectural designs. Make your way to the main attraction, the lavishly decorated Hall of Mirrors, which witnessed the signing of the 1805 Peace of Pressburg. Don't miss seeing the inner courtyard, complete with a statue of St. George, and the 17th-century English tapestries, which have survived in their original state for centuries. Work out when and for how long to visit Primates' Palace (Primacialny palac) and other Bratislava attractions using our handy Bratislava travel route builder tool . Nice squares that is along the Palace. The fountain of St. George to see. However, the Museum is wonderful. Concerns the history of Slovakia and really educates both for the history and for aspects of their everyday life. Wall causing the piece of torture. To visit for sure! Located in the historic centre of the Slovak capital, it is housed in a neoclassical building constructed in the second half of 1700. Inside, its most famous (the Hall of mirrors) peace of Pressburg was signed, ending the war of the third coalition. Currently, the building is the seat of the municipality of Bratislava. Beautiful. Will definitely be returning. TO VISIT! This place wants to be a flagship for local government and is frequently used for diplomatic meetings. It has also a museum section with the wall tapestries well-known story. Impasse it was well-known for public Wedding Place. All the patios are most of the day open for public free of charge and I suggest tourist to take a walk inside and have a look. Nice place to visit! Dont expect anything magnificent like palaces in Vienna. This one is quite small, but still has many beautiful pieces of art and pretty interiors. Sumer residence of Archbishop of Estragon. One of the most beautyful places in Bratislava. Well, very nice place for tourist visiting Bratislava. It is amazing, what can you see here. I really recommend. Great historical building. Great place vor various social events. Every day, we help thousands of travelers plan great vacations. Here are some tips on how to use your Listing Page to attract more travelers to your business - Primates' Palace (Primacialny palac). Promote your permanent link - https://www.inspirock.com/slovakia/bratislava/primates-palace-primacialny-palac-a110500351 - on your website, your blog, and social media. When a traveler builds a plan from this page, the itinerary automatically includes Primates' Palace (Primacialny palac). This is a great way for travelers looking for a great vacation in your city or country to also experience Primates' Palace (Primacialny palac). Promoting your link also lets your audience know that you are featured on a rapidly growing travel site. In addition, the more this page is used, the more we will promote Primates' Palace (Primacialny palac) to other Inspirock users. For best results, use the customized Trip Planning Widget for Primates' Palace (Primacialny palac) on your website. It has all the advantages mentioned above, plus users to your site can conveniently access it directly on your site. Visitors to your site will appreciate you offering them help with planning their vacation. Setting this up takes just a few minutes - Click here for instructions.